A Guide to Testing and Debugging Node Applications is an excerpt from Manning’s Node.js in Action, Second Edition. Thoroughly revised in its second edition, this book guides you through all the features, techniques, and concepts you’ll need to build production-quality Node applications. In most web development projects, functional tests work by driving the browser, then checking for various DOM transformations against a list of user-specific requirements. Imagine you’re building a content management system. A functional test for the image library upload feature uploads an image, checks that it gets added, and then checks that it’s added to a corresponding list of images. The choice of tools for functional testing Node applications is bewildering. From a high level they fall into two broad groups: headless and browser-based tests. Headless tests typically use something like PhantomJS to provide a terminal-friendly browser environment, but lighter solutions use libraries such as Cheerio and JSDOM. Browser-based tests use a browser automation tool such as Selenium that allows you to write scripts that drive a real browser. Both approaches can use the same underlying Node test tools, and you can use Mocha, Jasmine, or even Cucumber to drive Selenium against your application. Selenium is a popular Java-based browser automation library which can be used for testing Node applications. With the aid of a language-specific driver, you can connect to a Selenium server and run tests against a real browser. In this article, you’ll learn how to use WebdriverIO, a Node Selenium driver. The exact path depends on how Firefox is installed on your machine. 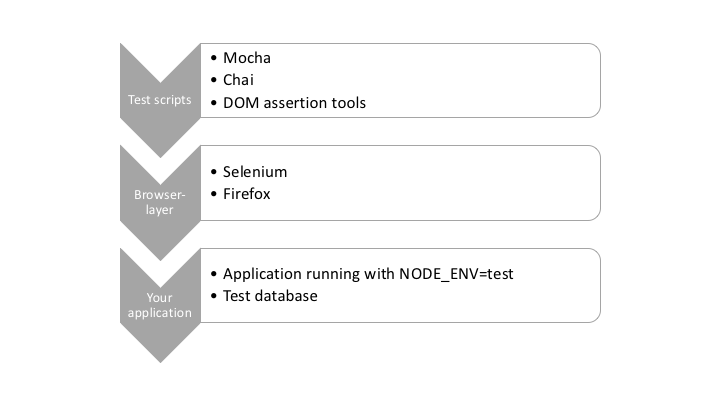 For more about the Firefox driver, read the SeleniumHQ documentation. You can find drivers for Chrome and Microsoft Edge that are configured in similar ways. Now add something to the test. A basic Express server will suffice. The example is used in the subsequent listing for testing. Save this listing as index.js. The above snippet uses ES2015. If you’d like a refresher on this, check out SitePoint’s course, Diving into ES2015. The good thing about WebdriverIO is that it provides a simple, fluent API for writing Selenium tests. The syntax is clear and easy to learn—you can even write tests with CSS selectors. The next listing (found in test/specs/todo-test.js ) shows a simple test that sets up a WebdriverIO client and then checks the title on the page. After WebdriverIO is connected, you can use an instance of the client to fetch pages from your app. Then you can query the current state of the document in the browser—this example uses getTitle to get the title element from the document’s head. If you want to query the document for CSS elements, you can use .elements instead. Several kinds of methods for manipulating the document, forms, and even cookies exist. Then type npm test. You should see Firefox open and the tests run in the command-line. If you want to use Chrome, open wdio.conf.js and change the browserName property. If you use WebdriverIO and Selenium to test a more complex web app that uses something like React or Angular, you’ll want to check out the utility methods. Some of the methods pause the test until certain elements are available, which is great for React apps that may asynchronously render the document, updating it several times based on when remote data’s available. Look at the waitFor* methods, such as waitForVisible to learn more. When you’re working on an established project, there’ll come a point when tests begin to fail. 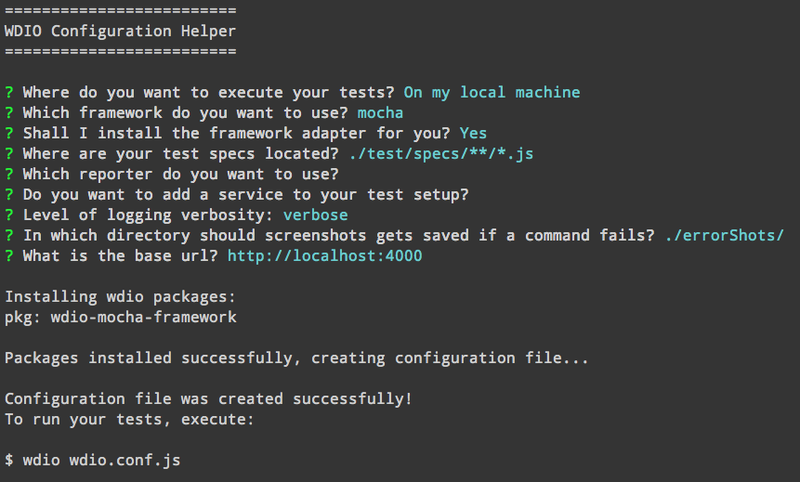 Node provides several tools for getting more detail on failed tests. Let’s talk about how to enrich the output generated when debugging failing tests. The first thing to do when tests fail is to generate more-verbose logging output. The next section demonstrates how to do that with NODE_DEBUG. When tests fail, it’s useful to get information on what the program is doing. Node has two ways to do this: one for Node’s internals, and another for npm modules. To debug Node’s core modules, use NODE_DEBUG. It’s clear from this trace that the problem lies in our file, inside a function on line 4 that was originally called from line 7. This makes debugging any code that uses core modules much easier, and it includes both the filesystem and network libraries such as Node’s HTTP client and server modules. The public alternative to NODE_DEBUG is DEBUG. Many packages on npm look for the DEBUG environment variable. It mimics the parameter style used by NODE_DEBUG, allowing you to specify a list of modules to debug or see all of them with DEBUG='*'. If you want to incorporate the NODE_DEBUG functionality into your own projects, use the built-in util.debuglog method. To make custom debug loggers that are configured with DEBUG, you need to use the debug package from npm](https://www.npmjs.com/package/debug). You can create as many loggers as you want. Imagine you’re building an MVC web application. You could create separate loggers for models, views, and controllers. Then, when tests fail, you’ll be able to specify the debug logs that are necessary to debug the specific part of the application. The following listing demonstrates how to use the debug module. Hiding certain modules means you can still use the wildcard, but omit unneeded or noisy sections from the output. If you’re using asynchronous operations, and that includes anything you’ve written using asynchronous callbacks or promises, then you may run into problems when stack traces aren’t detailed enough. Packages on npm can help you in such cases. For example, when callbacks run asynchronously, Node won’t keep the call stack from when the operation was queued. To test this, create two files, one called async.js that defines an asynchronous function, and another called index.js that requires async.js. To improve this reporting, install the trace package and run it with node -r trace index.js. The -r flag tells Node to require the trace module before loading anything else. Clarify is particularly useful if you want to include stack traces in error alert emails for a web application. The next time you’re struggling with a stack trace generated by asynchronous code, look for tools such as trace and clarify to make sure you’re getting the best out of what V8 and Node can offer. So there you have it. In this article we’ve looked at functional testing Node applications using Selenium, as well as some tips and tricks for dealing with failing tests. If you enjoyed this article, you can visit the book’s homepage and download the free first chapter of Node.js in Action, Second Edition or purchase the entire book. Mike Cantelon is a Vancouver, Canada, based software engineer and co-author of Manning Publication's Node.js in Action . Mike works on open source digital preservation apps.